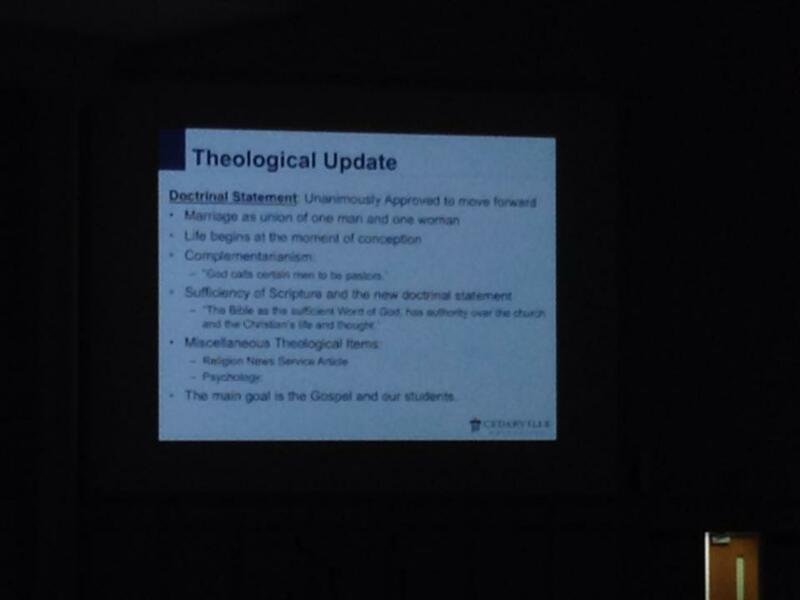 In a meeting held on January 27, Cedarville president Dr. Thomas White presented proposed new changes to the doctrinal statement. These changes are not yet official additions; per the university bylaws, they will most likely be presented to the trustees for a vote over the summer. It is unclear at this time how the proposed changes will affect faculty contracts for the 2014-2015 academic year, as faculty are typically required to affirm any doctrinal changes at each renewal. Dr. White also discussed a handful of miscellaneous items, including a recent Religion News Service article on Cedarville's treatment. White also addressed the science of psychology as it interfaces with his views on general and special revelation. Dr. White responded to most of the concerns by stating and supporting his belief that the changes reflect views and positions already held by the university for some time. White also felt that he had to move quickly due to "some constraints," but encouraged faculty to contact him via email if they had additional concerns. It is unclear at this time whether White's responses sufficiently allayed faculty concerns or whether the changes were simply advanced anyway. As previously mentioned, none of the new changes have been yet made official. Individuals with additional information on the new doctrinal statement or the validity of faculty input on the new document are encouraged to confidentially contact The Ventriloquist at ventriloquistpaper@gmail.com.